What's Next for Suu Kyi's NLD Government? Myanmar has sworn in its first civilian-dominated government in more than half a century. The military-backed transitional administration handed over power on March 30 to a successor led by Aung San Suu Kyi’s National League for Democracy. The handover ceremony confirmed that Suu Kyi would be taking on no fewer than four departmental portfolios in the new administration — foreign affairs, energy, education and the president’s office. Myanmar (formerly Burma) is plagued with lots of problems, including decades-long guerrilla wars in ethnic territories. Her education and health care system is crumbling. Her economy and politics are on shaky grounds. Her novice government also faces the continued might of an army that for years viewed Suu Kyi and her party with deep suspicion. The military still holds strong political sway under a charter that reserves a quarter of parliament seats for unelected soldiers and grants the army chief direct control over three key ministries; home affairs, border affairs and defense. It also ensured that one of Htin Kyaw’s two vice presidents is a former general, Myint Swe, a close ally of former junta leader Than Shwe. Myint Swe remains on a U.S. Treasury Department blacklist that bars American companies from doing business with several tycoons and senior military figures connected with the former junta. One of the serious problems, however, is the eliminationist project, practiced and promoted by the previous military regimes, as part of a fascist national project to purify Myanmar (formerly Burma) of the presence of non-Buddhists, the minorities, esp. the Rohingyas of the Arakan (Rakhine) state. The latest genocidal campaigns launched against the Muslims since 2012 have led to the internal displacement of nearly a quarter million people, and the risky sea voyages taken up by many that have led to the death and enslavement of hundreds. Muslim homes and businesses have been attacked, ruined or burned down to ashes in ethnic cleansing drives. Nearly 140,000 Rohingya and other Muslims in the Rakhine state continue to live in the IDP camps that are no better than concentration camps. The condition there is simply miserable and despicable and needs to be improved as soon as possible. The new government must ensure the safe return of the encamped victims to their rebuilt homes or places of former residence. More importantly, it must take up the task of stopping the disenfranchisement and continuing suffering and persecution of the Rohingya and other minorities that were born in the country by integrating them as full citizens with equal rights. Is NLD and Suu Kyi serious about bringing a desired change for all? Will she show leadership in the moment of crisis or choose to follow opportunistic policies that only exacerbate the existing problems taking the country on an irreversible course of disunity and ultimate fraction? Regrettably, Suu Kyi has been criminally silent on the genocidal campaign launched by her fellow Buddhist community against the persecuted Rohingya, which deservingly has drawn serious criticism from many quarters, esp. those who earlier had adored her as a human rights icon. 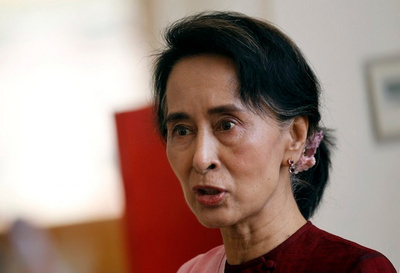 Many observers know Suu Kyi of spending many years, nearly 20 years, in the UK before returning home. Little known facts are that her first serious boyfriend was a Pakistani Muslim whom she befriended at Oxford who later went on to become a top diplomat for Pakistan and that one of the key people who persuaded her to get involved in Burma’s democracy uprising was Maung Thaw Ka, a Muslim journalist and author who subsequently died in jail. [Peter Popham: The Lady and the Peacock]It is difficult to imagine her in politics today without the influence of those Muslims. One would have thought that the influence of her mentor Maung Thaw Ka would have made her a complete or at least a better human being who won't see the world from the foggy lenses of intolerance, racism and bigotry that have underscored what is wrong with Burma and its toxic Myanmarism! But our expectations about her leadership in the time of crisis were proven wrong. When she should have visited the killing fields of Arakan (Rakhine) state, she chose not to see. When she should have heard the cries and agonies of the suffering victims of ethnic cleansing, she chose not to hear. When she should have spoken out, she chose to remain silent. When she should have condemned the heinous crimes of her fellow Buddhists (who have soiled the image of Buddhism) unequivocally she appeared to condone such criminal acts with a forked tongue. Hers was a betrayal of trust and what could have been decent and good! It was a far cry from her self-adulating ‘fear from freedom’! Some admirers have suggested that if she spoke up for the much persecuted Rohingya, it would make it easy for her enemies (esp. within the military and fascist Buddhist monks of the Ma Ba Tha) to repeat the argument that she is not a full Burmese Buddhist – and if the Burmese masses fell for it, that could erode her standing and her chances of coming to power; so she has been sitting uncomfortably on the fence for the past five years. I find such arguments politically opportunistic and morally indefensible. After all, great leaders don’t follow the crowd but let the crowd follow them. They are not a searcher for consensus but are a molder of consensus. They don’t let the popular mob culture define their leadership role either. Suu Kyi's hypocritical attitude, sadly, towards the painful sufferings of the Rohingya people has been simply inexcusable, and revealed something that was both ugly and evil. It set her apart from the noble predecessors like (late) Nelson Mandela and Desmond Tutu of South Africa, and many of the genuine luminaries that had won the much coveted Noble Prize for peace. Myanmar remains locked in its shameful past of racial and religious chauvinism and hatred. Not only were prejudices exploited to divide this nation along racial and religious lines and justify the rule by the powerful military for more than half a century, they were used as a glue to promote and cement or gel the racial and religious superiority of the Bama over every other race. As a result, instead of Abraham Lincoln’s ‘government of the people, by the people, and for the people’ what we have in Myanmar is ‘government of the Bama people, by the Bama people and for the Bama people’. All the non-Bama peoples are there to serve the interest of the majority Bama people, who happen to follow Theravada Buddhism. Suu Kyi comes from that very stock. As Dr. Shwe Lu Maung puts it she is leader born of the chaos. Many Burmese Buddhists are extremely prejudiced against non-Buddhists, esp. Muslims. But is Aung San Suu Kyi also guilty of such a flaw? In his book: Is Suu Kyi a Racist, Dr. Shwe Lu Maung (Shah Nawaz Khan) - now living in the USA and originally from Burma and author of some major volumes of work dealing with his native country - tries to answer the question objectively. It should be a must-read book for anyone interested about the future of Myanmar under Suu Kyi’s leadership. After a torrid interview with BBC's veteran journalist Mishal Husain for the Today programme, Suu Kyi was reportedly heard to say angrily, “No-one told me I was going to be interviewed by a Muslim.” It is said that if it walks like a duck, quacks like a duck, looks like a duck, it must be a duck. Suu Kyi’s remarks speak volumes and reveal something that is, sadly, very unpleasant and unbecoming about a lady who was once considered a democracy icon. Truly, I find her bigotry-ridden remarks about one of the most unbiased and objective interviewers of our time simply disgusting and inexcusable. I was one of those former admirers who wanted to believe that Suu Kyi is a progressive human being who has been able to rise above the evil curses of racism and bigotry that have poisoned her country since its birth. But she disheartened me and billions of people around the globe through her bigotry, and an overt one in that, which is also very unnerving and unfortunate for a country that has many races, ethnicities and religions. Racism and bigotry are serious diseases, and according to Dr. Shwe Lu Maung, more like a variety of Freudian narcissism, which needs cure. For Myanmar to survive as a nation, she must discard her culture of prejudice and intolerance that has, sadly, defined her character in the post-independence era. Will Suu Kyi now become a true leader for a fractured country that needs a unifier and not a divider? I can’t predict the answer yet but can only pray and hope that she evolves into becoming a unifier, much like her legendary father Aung San was before his untimely death. The sooner the better for not only Myanmar but for the entire region!